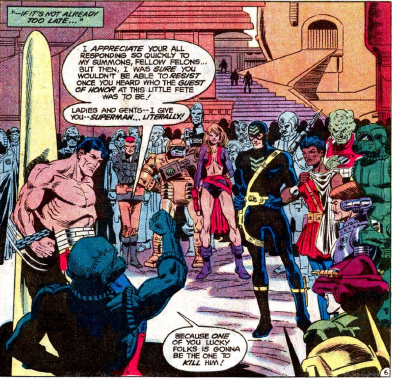 Marv Wolfman is joined by Paul Kupperberg on scripting the concluding half to the Superman/Omega Men team-up in Action 536 (Oct. 82), while Sal Trapani joins doing the inks on Joe Staton pencils. The Omega Men make a valiant effort to pummel down into the ground and follow the Mole after he steals the injured and weakened Superman, but have little success. 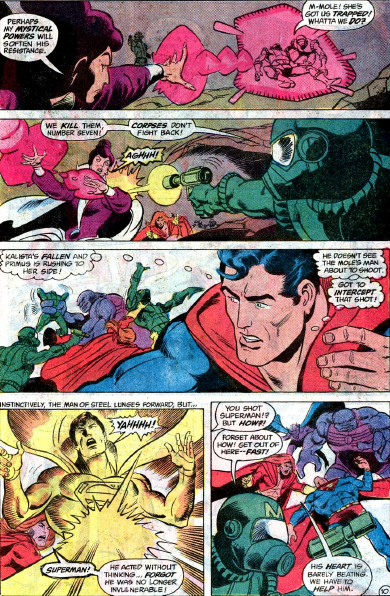 The Mole intends to auction off Superman for the privilege of killing him. Disappointingly, none of the villains seen at the auction are anyone we recognize. Lois Lane hunts down Cave Carson, an underground explorer not seen since his last Showcase try-out appearance in the mid-60s. He is old and cranky now, but gets persuaded to use his “mighty mole” to follow the Mole’s trail, bringing the Omega Men to the underground auction site. 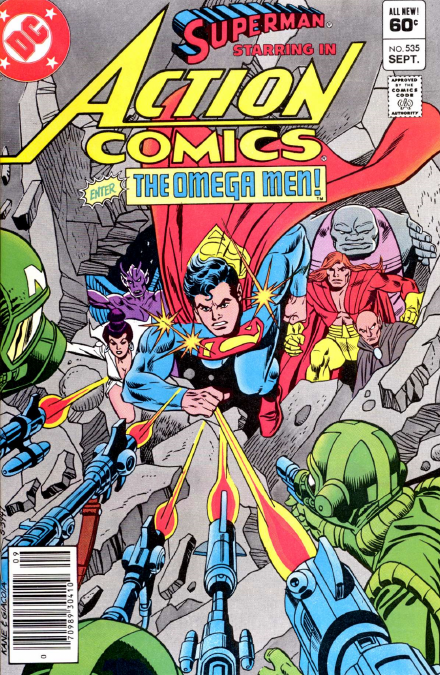 The Omega Men rescue Superman, and in exchange he brings them up to the JLA satellite, to help them find a way home. 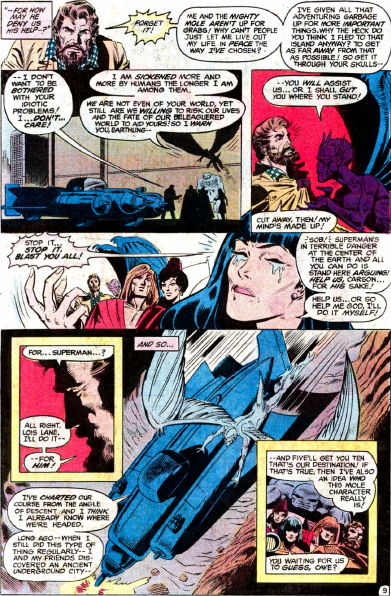 This gets interrupted by the emergency signal, and Superman retrieves Raven’s soul-self, hovering outside the satellite. Inside, Raven releases the other New Teen Titans, Robin,Kid Flash, Cyborg, Changeling and Wonder Girl. The story continues in the next issue of New Teen Titans. 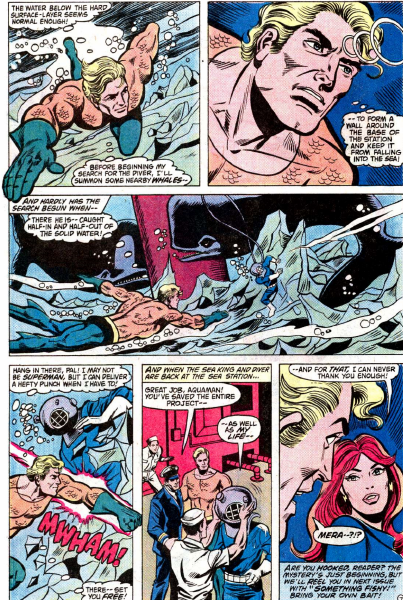 Aquaman dreams of Mera in this story by Rozakis, Saviuk and McLaughlin. 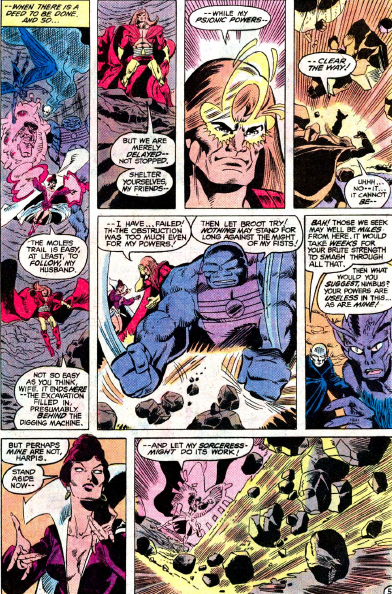 Mera had vanished back to Xebel, her home dimension, during the battle with Atlanna, and not returned. 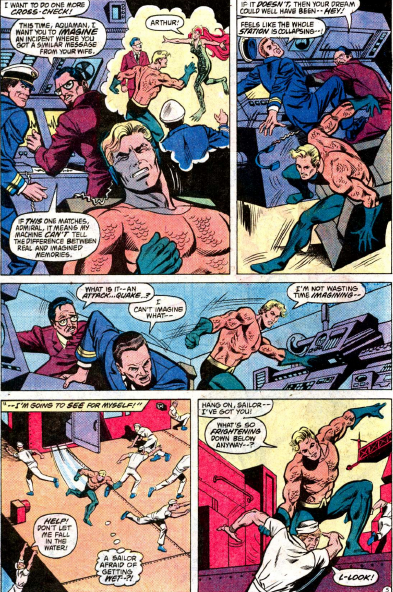 Aquaman wonders if the dreams are actual messages, and has some tests done to try to figure that out. 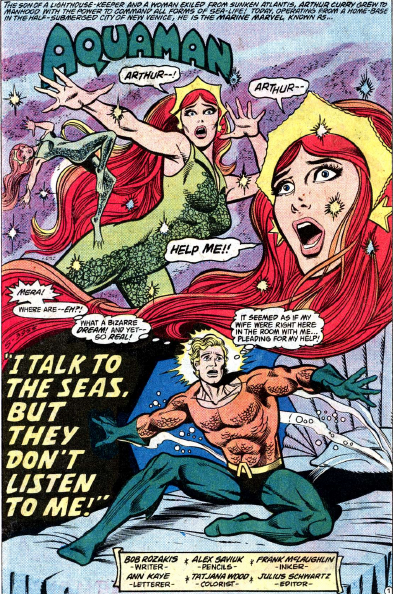 The tests don’t really answer his questions, but he does find a Mera lookalike as the issue ends. 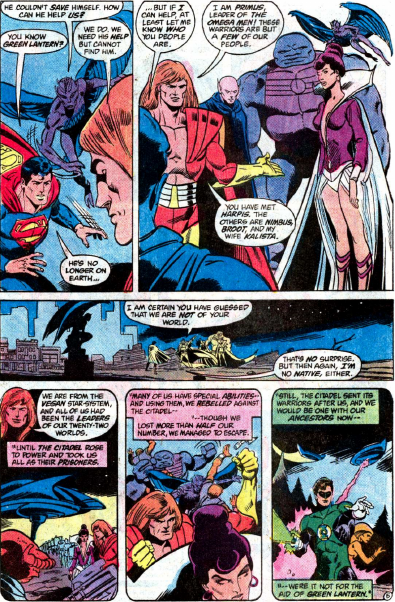 Superman is at half power, having been split into two people in the previous issue, in the Wolfman, Staton and Marcos story in Action 535 (Sept. 82). Superman finds himself cast back to Earth abruptly, and runs into the Omega Men, a group of aliens on the run, last seen in their introductory story arc in the pages of Green Lantern the previous year. Primus, Kalista, Broot, Nimbus and Harpis explain their story to Superman. They prove to be some help as a villain called the Mole attacks various buildings in Metropolis from underground, including the Daily Planet. 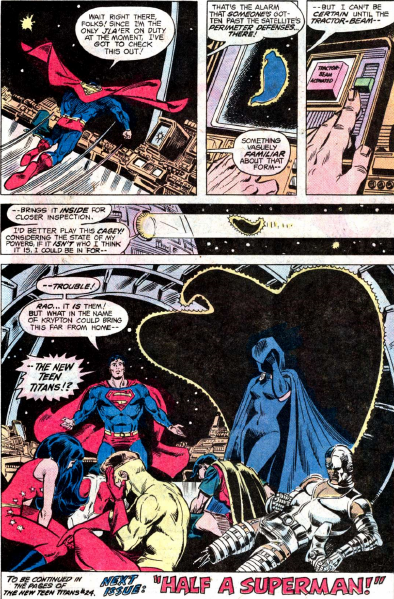 Superman is not used to his power loss, and overestimates his invulnerability. 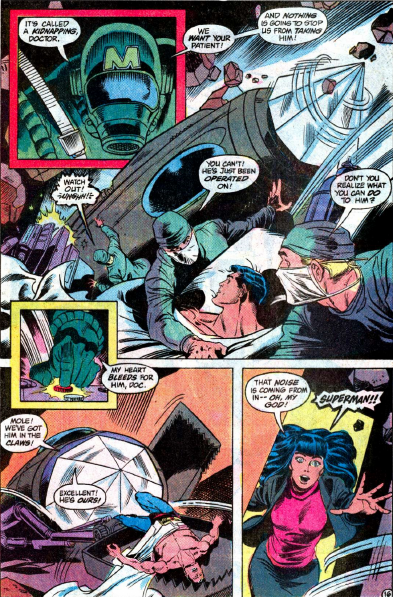 The Omega Men bring him to a hospital, and Kalista brings Lois Lane, who he has been calling for. But the Mole and his men think that even a powered down Superman is a prize to be had, and break into the hospital to steal him. 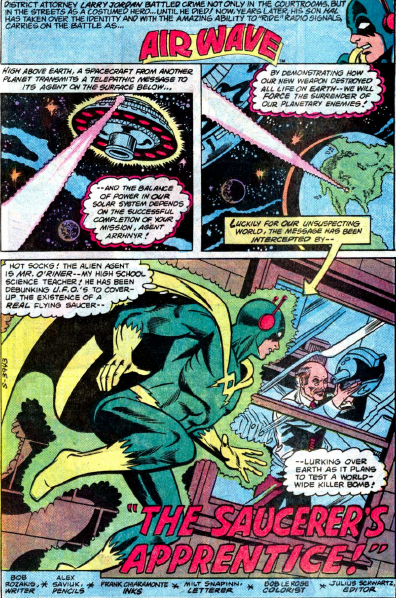 Air Wave concludes his final solo story, by Rozakis, Saviuk and Chiaramonte, as he spies on his high school science teacher, who seems to bean alien. Air Wave doesn’t fare too well against the man himself, he manages to escape capture. But Hal does prevent the man’s bomb from going off, taking it high into space, which neutralizes the explosion. 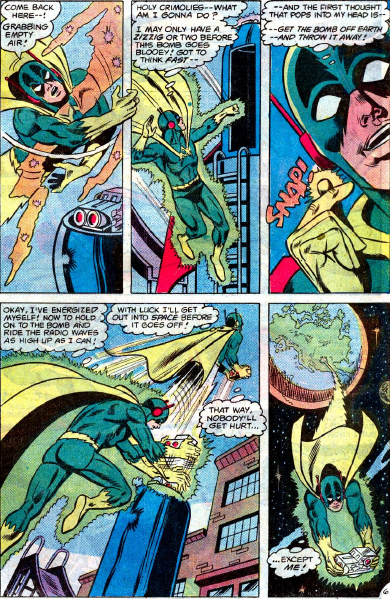 In the end, Air Wave is called to the Justice League satellite, where he is lauded by Superman, Batman, Wonder Woman, Aquaman, Atom, Green Arrow, Black Canary and Hawkman for his quick thinking. 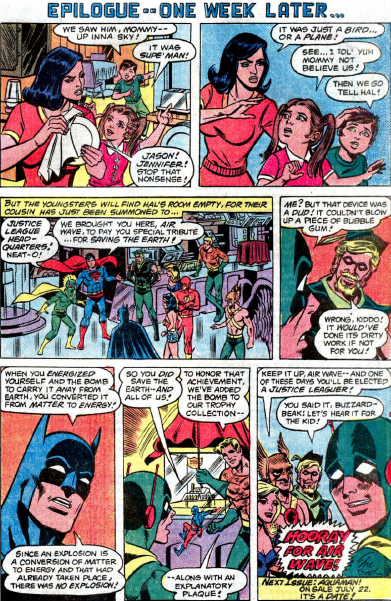 They even tell the boy that one day he might become a member of the Justice League himself. Sadly, this is really the high point of Air Wave’s career. 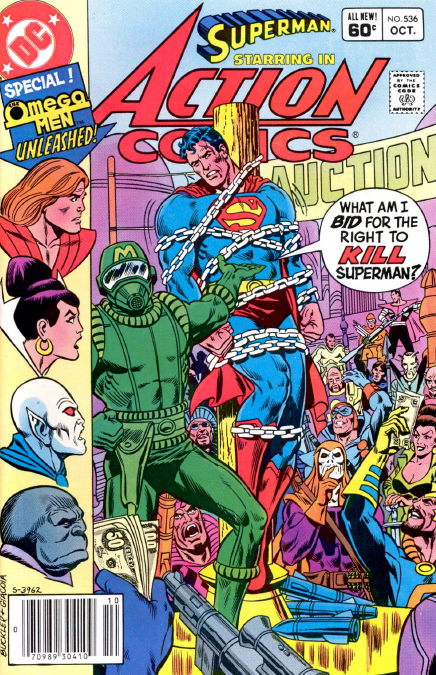 He returns in a couple of months in an issue of DC Comics Presents, and will pop up occasionally over the next couple of decades, but never again carry his own series.